Imagine hearing a grieving friend share these penetrating and emotional questions. How would you respond? What concerns would surface? Are these struggles a sign of spiritual health or a wavering faith? It might surprise you to know these questions are not only pointed; they’re inspired. No, your friend is not adding to the Bible. He’s quoting Psalm 77. And if you examined the text, you’d find four additional statements wrestling with deep sorrow. Your weeping friend isn’t abandoning the faith. He’s lamenting. And if you don’t know this biblical song of sorrow, you’ll be less helpful—maybe even hurtful. Lament is a prayer in pain that leads to trust. It’s the historic minor-key melody that God’s people sang when the brokenness of a sin-cursed world invaded their lives. Sometimes the grief was personal. At other times sorrow impacted an entire community. When injustice was in the air, lament vocalized a longing for vindication. And if specific sin was the cause, repentant laments were sung. There’s a lament for every sorrow. Over a third of the Psalms feature this tear-filled tone. Perhaps that’s why we are so quick to run to the Psalms when we are hurting. The official song-book for God’s people not only gives words to our pain, but it also empathizes with us. It feels what we feel. It says what we want to say. Laments, however, do more than emote. They direct our pains and struggles to a renewal of trust. There’s a divinely given liturgy or a path for grief. Most laments include a decision to turn to God in prayer, honestly telling him what is wrong, asking for help, and choosing to trust. Each interconnected step (turn, complain, ask, trust) helps us live between the poles of a hard life and trusting in God’s sovereignty. The Biblical language of lament is a gift. It vocalizes our grief so we can receive God’s grace. It is helpful for your grieving friend, but it’s also a resource for you as you journey with them. When you understand this historic prayer language in the Bible, it allows you to help a grieving friend in unique ways. Familiarity with lament helps you understand the struggles in sorrow. Laments provide an ability to interpret your friend’s emotions as you walk side-by-side through their sadness. Grief creates troubling questions. Frightening emotions surface. As a result, friends and family experience the temptation to keep their distance. Others offer trite solutions. And unfortunately, well-intentioned people confronted with the expression of deep sorrow can say, “It’s not helpful to talk like that.” Biblical lament begs to differ. Lament equips you to listen and resist the urge to silence your friend. Fluency in lament also allows you to speak the sorrowful language of grief. It vocalizes your empathy. Lament allows you to sit beside people in their sorrow. It invites you to travel the messy labyrinth of their pain as you join them in talking to God about what your friend feels. Prayers of lament communicate the most important message in helping a friend: I’m here. As you walk with your friend through their grief, your lament prayers can help embolden their faith. Laments involve a prayer journey—turn, complain, ask, and trust. When you put aside trying to fix the problem and embrace the tension of the pain, you have the opportunity to lead your friend to renewed trust in God. Empathy gives you credibility to boldly ask God to help. And as you rehearse the biblical promises and express your confidence in God, your praying can help your friend to hope again. Lament is a prayer language that allows you to point your grieving friend to truth that is easily forgotten. You can help dispel the fog of sorrow as you learn the biblical voice of comfort. Grief is not tame. Lament is how grieving people can process their sorrow. This biblical song of sorrow provides a unique comfort for a hurting friend as he navigates the process of healing. Lament stops giving God the silent treatment. Whether it’s because a friend doesn’t know what to say or the disappointment is too strong, pain creates the temptation to no longer talk to God. However, the Psalms model an honest and humble posture, praying through our struggles, fears, and doubts. Lament invites a grieving friend to keep praying even if its messy. Laments are not cul-de-sacs of sorrow. They are conduits leading to trust. When a friend learns to turn to God in pain, lay out complaints, and boldly ask for help, he’s able to take the last and most important step: choosing to trust. All laments are designed to lead here. Songs of sorrow help remind a grieving friend what he believes. The lamenting process intentionally rehearses what is true while pain lingers. Walking through grief is a daily battle. With the dawn of a new day comes the promise of fresh mercy (Lam. 3:23), but also unique struggles and waves of grief. With over forty laments in the Bible, there is a deep bench of spiritual resources from which to draw. If your friend can learn to pray his own prayers of lament, he’ll discover a new arsenal for the daily struggle for hope and endurance. Laments don’t solve all the problems, but they can give a friend a language for the long journey toward healing and recovery. Walking with a friend assaulted by sorrow requires skill and compassion. You will not be able to fix the problem. But you can be present and find ways to join in the messiness of grief. Lament is the biblical language of sorrow that can not only handle your friend’s pain, but it can also provide you with the tools you need to help. Pain surfaces difficult questions. God isn’t surprised by them. In fact, he inspired tough questions in the Lament Psalms. One of the best ways that you can help a hurting friend is to learn the language of their pain. Even more, you can teach your friend how to talk to God while walking through a dark valley. When you learn to lament, you open a door for God’s grace as you try to help and as your friend begins to heal. Lament invites the comforter and a grieving friend to talk to God about the pain. When a friend is filled with sorrow, remember to lament. It’s the biblical language of sorrow that leads to God’s grace. 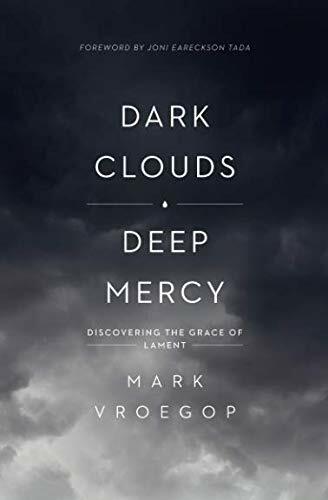 For more on lament, check out Mark’s new book, Dark Clouds, Deep Mercy: Discovering the Grace of Lament, © 2019 from Crossway. Mark Vroegop (MDiv, Grand Rapids Theological Seminary) is the lead pastor of College Park Church in Indianapolis, Indiana. He is a conference speaker, a trustee of Cedarville University, and is the author of Dark Clouds, Deep Mercy: Discovering the Grace of Lament.